Rayagada is about 440 kilometres away from Bhubhaneshwar, the capital city of Orissa. Apart from the district headquarters, Rayagada, the other significant towns of the Rayagada district are Muniguda, Gunupur, Gudari, Kasipur, Kalyanasingpur and Bissamcuttack. 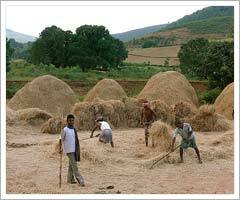 There are several scheduled tribal communities dwelling in Rayagada. They continue to lead a rustic lifestyle in the lap of nature. These tribal societies embrace the faction of people who understand the meaning of living together and join hands to work together to achieve any shared interest to cater to the benefits of their society. Every society has its own set of rules with respect to business and trade. These enhance and strengthen their unity to live and toil collectively as one. The tribal groups although have undertaken various forms of odd jobs at present, yet their basic livelihood depend on hunting and cultivation. In the past eras, the tribal land areas were never surveyed and they did not lead a settled life. The tribal people carried out shifting cultivation, taking into consideration that they were the possessors of the natural resources like the river water, forest trees and the lush green lands. This practice of self cultivation still continues till date. The rituals and festivals practiced by the tribal groups are still being followed, respected and nurtured since the distant past to the present day. Although the art of performing the songs and dances differ from one clan to another, yet certain features are generally familiar to all. Their social life revolves around their deep-seated religious practices and viewpoints. They also celebrate a number of festivals. The personal or domestic affairs include occasions concerning marriage, death or birth of an infant whereas the whole village get together to observe events like rich harvest and mellow fruitfulness. The place has a pleasant cultural amalgamation where people speak languages like Oriya, Telugu and popular tribal languages like Saora. The place is also well known for its blissful ambiance. The major attractions of the place are the Maa Majhighariani Temple in Southern part of Orissa and Andhra Pradesh, the wonderful scenery at Hatipathar, Gayatri Temple at MITS College, the Shiva Lingams at Paikapada, the gorgeous waterfall at Chatikona, the Lakshmi-Narayan Temple at Therubali, the Maa Markama Temple at Bissam Cuttack, the Shiva temple at the culmination point of the three rivers at Minajhola, the Devagiri Hills and the Manikeswari Shiva shrine at Padampur. All these beckon tourists from far off lands to visit the district of Rayagada.